Dr. Neo Cortex is back and up to no good in the latest instalment of the Crash Bandicoot series on the XBox games console. I must confess that it felt weird playing a game which used to be Sony's flagship character on the opposition's machine. However, with the huge amount of improvements that have been made, it's easy to understand why XBox gamers have been treated to the marsupials adventures. Firstly, this is the best looking Crash game hands down. Textures are detailed and plentiful and animated to the point that for the first time Crash actually has fur!! That's correct, you can discern fur moving as he ducks and weaves through the game. The basic storyline is simple yet fun. Cortex has developed a super weapon to take out Crash and his sister Coco and take over the world: A Super-Bandicoot called Crunch who is almost all powerful and certainly seems hopped up on something. 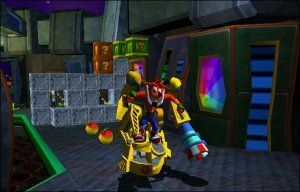 As per the previous Crash games, the adventures revolve around a hub system that finally results in 30 new action packed levels. 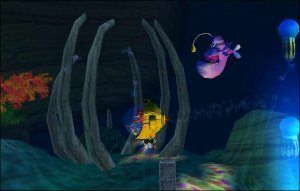 A bane of the PS2 version of the same title was the exceedingly slow loading times for every level. These have been all but banished from the XBox version with a wait of about 5 seconds for each level to load. Framerates for the game are solid and never seem to take a real hit even when the action is fast and furious. Everything is polished and a real improvement over it's predecessor. That was one of my main complaints over the previous PS2 version. I feel bad comparing console versions of a game however it is almost a necessity when covering this title. Whilst enjoyable on Playstation 2, I feel that this XBox version has been given a lot more love than the last one. It just didn't truly feel like a next generation game. This one does. Sound is handled well in the game and is handled in a great way with all the classic tunes making their appearance once again to assault your eardrums. It is a bit confusing when using a surround sound setup to discern exactly where everything is coming from so I would suggest just using your television speakers for this one. 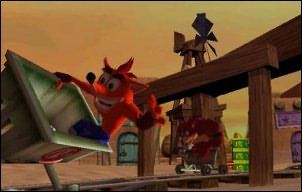 The control system is easy to follow as it has been in the past, however Crash can learn new moves within the game as he progresses. Spinning, ducking and attacking are but a small part of his repertoire. Not unlike Crash: Warped you do get to play as his sister Coco. I enjoyed this experience on Warped when playing as Coco I got to ride on the back of a tiger along the Great Wall of China. 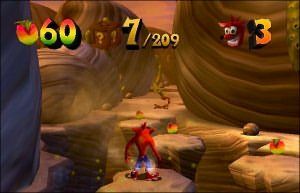 This time around the experience is just as cool as on previous occasions, however it does take some getting used to going from the extreme mayhem that is the joy of playing as Crash to a less powerful creature such as Coco. Using the vehicles scattered around the game are fun and add a great element to it all. They are easy to control and are not so hard to use that you forgot how to make everything work. For the most part it's a simple matter of up, down, left and right. A word of warning: be careful with some of the platforming elements of this game. Perspective is skewed at certain points and can be misleading. So, if you are not sure of a jump make sure you've had a good look before making a leap of faith. Peaches are once again a staple in Crash's diet giving him extra lives etc. Make sure you crush and spin as much as you can as they are hidden all over the place and will make your life much easier. Bosses are fun at the end of each hub and well thought out. Animations are strong and do the game credit. Be careful though and do not underestimate them if you are finding it easy during the usual levels. They are called bosses for a reason! 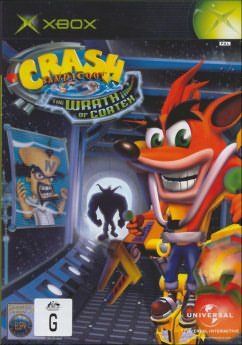 Crash Bandicoot: The Wrath of Cortex is a great title on the XBox and continues in the solid tradition of the rest of the series. A good solid fun game!